There are numerous decks of playing cards that have, in one form or another, a nature or wildlife theme, especially if the category of "nature" is expanded to include pets, such as dogs and cats. One example is the Mustang Playing Card Gift Set by American Expedition, shown at left. 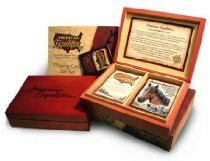 The Playing Card Gift Set features an American Expedition wildlife deck and an "Explore and Discover" logo deck inside a hand-crafted wooden storage box. I can't think of many horse-lovers who wouldn't like receiving this gift. 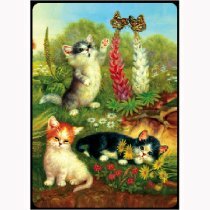 Cats are a very popular image for playing cards, and so are butterflies. SunsOut (a company more well-known for its jigsaw puzzles) manages to combine both themes delightfully in their Cats and Butterflies Playing Card Bridge Deck. If there are cats, there must also be dogs. The Dogs of the World Playing Card Deck is handy, in that each card features a different breed. As the deck's manufacturer reminds us, "Thousands of years ago, a bond of loyalty, trust and affection was forged between Dogs and Humans, a bond stronger than every today. There are now over 300 different breeds world-wide, from the tiny Chihuahua to the powerful and heroic St. Bernard, and, of course, everyone has their own favorite. This fascinating deck depicts most of the popular breeds, including working, utility and gun dogs, as well as dogs valued today purely for their beauty and companionship." The deck is printed in Belgium. There are hundreds of other playing card decks in the nature and wildlife category - if one were to attempt to collect them all, it would be a huge undertaking. But one could make a fairly nice collection from a subcategory, such as Horses on Playing Cards.